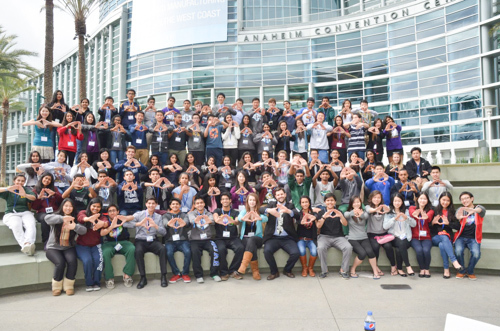 In early February more than 100 students from Harker’s DECA chapter traveled to the Marriott Hotel in Anaheim to attend the California State Career Development Conference (CDC). The three-day event featured workshops with renowned speakers, tough competition and experiences for a lifetime. Harker performed admirably with 26 finalists in the top eight; of those, 16 advanced to the top four, qualifying for the International Career Development Conference (ICDC). In addition, Harker will send eight students to ICDC to participate either in The Stock Market game or the Virtual Business Challenge. After school on Feb. 5, 103 students took charter buses from Harker to Anaheim, stopping only for refreshments at In-and-Out Burger. The following morning, Harker hosted a chapter breakfast at Denny’s and “Officer Hours,” during which students could get last-minute advice and tips. That afternoon, students took their written examinations and then headed to the opening session. During the opening session, Sandip Nirmel, grade 9, spoke to the crowd, urging them to elect him president of the 64th California DECA Team. Although Nirmel did not win, he did a great job and was recognized by many of his peers as a rising star. Next, attendants gathered for their role-play events. After the competition, Harker DECA took the students to Disneyland to relax after a challenging, but rewarding day. The next day students competing in written events had their time to shine. Afterward, at the Recognition and Mini-Awards Session, Harker was honored for its wonderful performance as a chapter. Harker was the only California school to complete every campaign: Membership, Global Entrepreneurship, Promotional and Community Service. For this achievement, Harker earned six extra stops to the ICDC Thrive Academy. In addition, out of a total of six California teams to qualify for the international conference in the Stock Market Game, Harker sent three. The day ended with a conference dance, at which students let loose and had fun after a full day of competing and learning about business. Throughout the weekend, workshops were held to complement the competition. Topics included communication, manufacturing, technology, start-ups, financial planning and networking. Students found them entertaining and helpful, and came home eager to begin implementing some of the tips in their daily lives. “In our free time, we went to workshops, which covered topics about everything from understanding relationships between people to healthy business practices. It was really awesome to talk to the business professionals!” said Tong Wu, grade 10. In addition, protégé events (examinations based on specialized skill sets) included green business, event planning, finance and investing, real estate and emerging leaders. Harker competed and finished top eight in every event. Two students placed among top three; Shannon Hong, grade 10 earned first place in emerging leaders, Mabel Luo, grade 12, took third place in event planning. The finale was the Grand Awards Ceremony, at which Harker took a record number of wins (see results below) and left as one of the most-respected schools. The International Career Development Conference will be May 2-7. More than 20 Harker students are expected to represent us. Go Eagles! First Place: Simran Singh, grade 11, Entrepreneurship Written Plan. Second Place: Julia Fink, grade 12, Apparel and Accessories Marketing; Raymond Xu, grade 9, Principles of Finance; Riya Chandra and Alexis Gauba, both grade 9, Entrepreneurship Innovation Plan; Emily Lin and Allison Sun, both grade 12, Sports and Entertainment Marketing Operations Research Event. Third Place: Ankur Karwal and Mehul Khetrapal, both grade 10, Entrepreneurship Innovation Plan; Leo Yu, grade 11, and Sophia Luo, grade 10, Hospitality and Tourism Operations Research Event; Simran Singh and Manthra Panchapakesan, both grade 11, Marketing Communications Team Decision Making Event; Alexander Mo, grade 9, Professional Selling Event. Fourth Place: Sachin Vadodaria, grade 12, Director of Individual Series Events and Business Finance Individual Series Event; Raymond Xu, grade 9, Principles of Finance. Fifth Place: Shannon Hong, grade 10, Restaurant and Food Service Management Individual Series Event; Monica Thukral, grade 12, Food Marketing Individual Series Event. Sixth Place: Arben Gutierrez-Bujari, grade 9, Professional Selling Event; Jonathan Lee, grade 11, Sports and Entertainment Marketing Operations Research Event. Seventh Place: Sapna Suresh, grade 12, Entrepreneurship Participating – Franchising; Jeton Gutierrez-Bujari, Glenn Reddy, both grade 11, Marketing Communications TDM; Sandip Nirmel, grade 9, Principles of Finance. Eighth Place: Mabel Luo, grade 12, Business Services Marketing Individual Series Event; Ria Gandhi, grade 9, Entrepreneurship Participating – Independent. Harker DECA is an international competitive business organization that prepares emerging leaders and entrepreneurs in four fields of business: marketing, finance, hospitality and management. Our DECA chapter integrates classroom instruction, applies learning, connects to business and promotes competition to prepare the next generation to be academically prepared, community oriented, professionally responsible and experienced leaders.